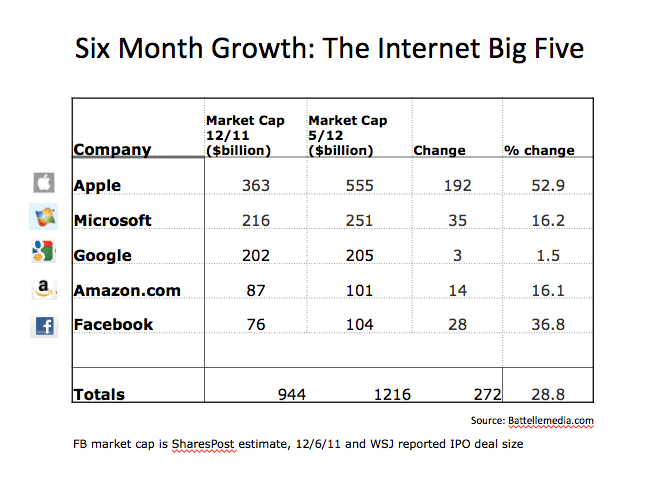 Last December I posted on “The Internet Big Five,” noting their relative strengths and the market cap of each. Since that time, the Five have only gotten stronger, adding a cumulative $272 billion in market cap (much of that is Apple, but Amazon and Facebook – assuming the offering does as expected on Friday – have also increased quite a bit). All in all, nearly 30% increase in value for these five companies – sort of makes me wish I was an investor, rather than a writer and entrepreneur. I’ll also check the number of engaged users for each platform, to see if there are any significant shifts, though I don’t recall seeing any in the news recently (save Facebook crossing 900 million users). It is interesting to note that Facebook, should it hold its supposed valuation, will be more highly valued than Amazon. ..there’s more to the selection of this Big Five than just market cap. In fact, there are four main criteria for making it into the Big Five. First, as I began to describe above, the companies must have financial heft, both in terms of large equity capitalizations, significant cash on hand, and a defensible core profit making machine. This gives them the ability to throw their weight around: they can make strategic acquisitions (like Google’s acquisition of Motorola), and they can leverage their profit centers and cash positions in any number of ways that offer them flexibility to play the corporate game at the very highest levels. Third, the companies must have deep engagement with those consumers, the kind of engagement that builds brand and creates massive stores of useful data. The relationship between the brand and its customer has to be meaningful and consistent (therefore creating permission to extract a premium and offer new products and services). It takes an ongoing service relationship for such engagement to occur…. More on the product strength of the Big Five here. What’s particularly remarkable is that even though it has a $500B market cap, Apple’s P/E is <13…(Amazon's is 180+). Apple wouldn’t have a business without the Internet. AppWorld is a dead garden without the rain of the Web. I think that this is the case of Facebook and Amazon. Amazing chart! Considering that the S&P 500 Index has only grown 2.99% YTD; this really magnifies the relative importance (on multiple levels) of these companies and their contributions to our society. Wow, I’m blown away by this group and specifically, Apple’s amazing growth – that’s insane! Wow, I’m blown away by this group and specifically, Apple’s amazing growth – that’s insane!